If you’ve been involved in any gun debates lately, you’ve likely heard, or maybe even said, “No one is coming to take your guns.” This is often used in an effort to belittle the opponents’ arguments by making them appear to be paranoid conspiracy theories. Even Vice President Joe Biden says that the very idea is “bizarre”. I decided to see if I could come up with any examples of gun confiscations in America in an effort to come to my own conclusion. This list is the result of that research. When people read the word confiscation, they generally picture jack-booted thugs going door-to-door to take property away by force. Most of the items in this article do not depict authorities pounding on doors and dragging people into the streets, and some only reference politicians talking about their desire for confiscation. This list is simply a compilation of confiscation-related items that I found during my search. Feel free to use it as you see fit. 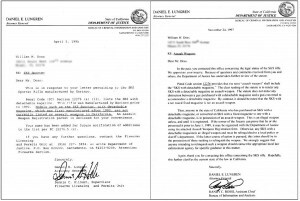 The owner of an assault firearm purchased on or before May 1, 1990 which is on the list of assault firearms determined by the Attorney General to be legitimate for target-shooting purposes shall have one year from the effective date of P.L.1990, c.32 (C.2C:58-12 et al.) to register that firearm. (3) Voluntarily surrender the assault firearm pursuant to the provisions of N.J.S.2C:39-12. Here is an article from the LA Times on the ban. This ban remains one of the toughest in the nation, and has resulted in confiscations such as this one over a decade later. Senator Feinstein was responsible for the 1994 Assault Weapon Ban, a tougher version of which she tried to reintroduce in 2013. In this 1995 video from “60 Minutes”, she freely admits that she wanted to “ban them all” in this 1995 video. While every gun owner is happy that her desire for confiscation did not come to fruition, this video is often used to show what she really wanted. The 1989 Roberti-Roos Assault Weapons Control Act required registration of “assault weapons” including the SKS Sporter within the state of California. This rifle is a very common military surplus weapon often imported from China. 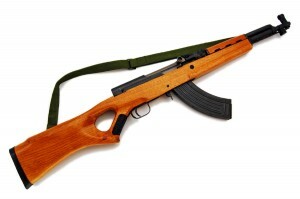 They are popular because they are inexpensive and some models can take standard AK-47 magazines. The Roberti-Roos Act allowed people in California to keep their SKS Sporters, even if they had the detachable magazine, so long as they passed a background check and registered them with the state. 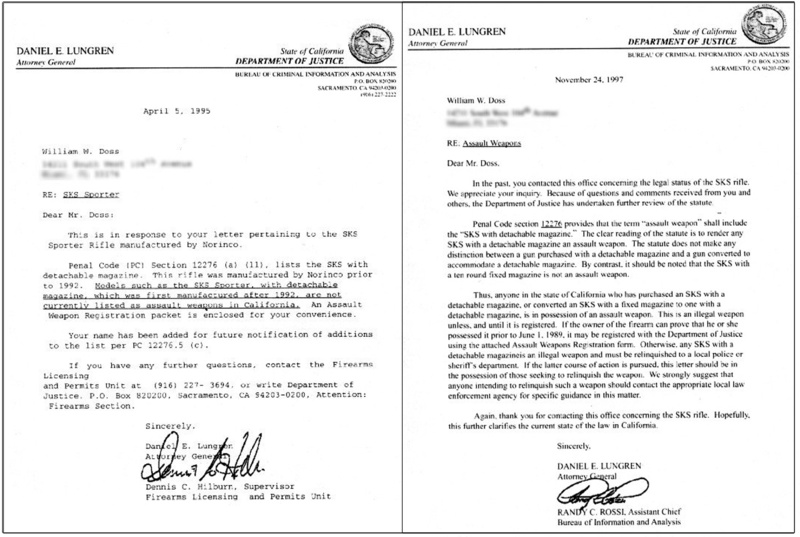 In 1997, Attorney General Daniel Lungren decided that he had changed his mind, after which these same rifles, dutifully registered by many law-abiding gun owners, were no longer legal. No change had occurred in the law; the AG simply changed his mind and with the stroke of a pen, ordered anyone in possession of these rifles to turn them in, ship them out of state, or have them destroyed. The letters to the right are from this page. More information regarding this matter can be found here and here. The aftermath of Hurricane Katrina was a horrifying event for many people. 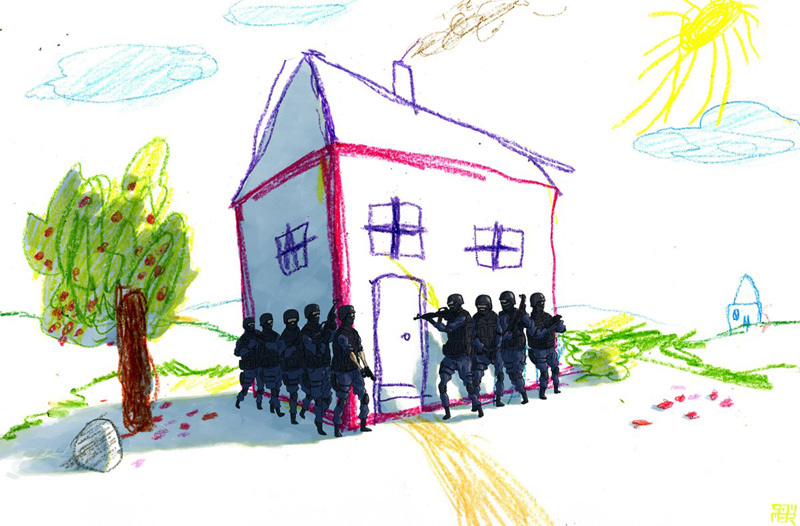 Some, though, were prepared and chose to stay in their well-stocked homes, armed with firearms for protection. Police Superintendent Eddie Compass said, “No one will be able to be armed”, and further stated that, “Guns will be taken; only law enforcement will be allowed to have guns.” He then sent out squads of police to confiscate guns from private citizens. These seizures were done within homes, without a warrant, and in at least one famous example, through the use of excessive force. See for yourself as you watch the videos embedded in this section. The second video shows the police using extreme force to tackle and detain Patricia Konie, a 58 year old woman who did not appear to be a threat to the heavily armed police force that had come to disarm her. They managed to fracture her shoulder after which she was taken into custody for refusing to give up her gun. You can read a summary on Wikipedia. As a result of these and other events, the New Orleans police department underwent major reforms. The Disaster Recovery Personal Protection Act of 2006 was also proposed in Congress, but it died in the Senate. Senate Amendment 4615 (The Vitter Amendment) was attached to the Department of Homeland Security Appropriations Act of 2007 (H.R. 5441) in order to put the same rules into effect. This federal law prohibits the seizure of lawfully held firearms during an emergency. 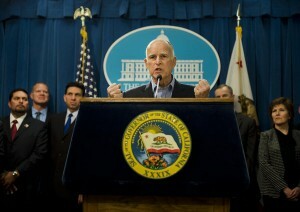 Recently in New Jersey, a number of gun laws were considered by the legislature. An audio transcript of the entire event can be heard here (check out this link and choose the May 9th, 2013 session if the first link doesn’t work). After the hearing was over, some of the senators started talking near an active microphone. Take a look at the video embedded in this section to hear what they had to say. This video may be easier to see and hear if you watch it on YouTube. Here are some well-known NJ news sources that talk about this event: NJ.com link #1 and NJ.com link #2. These videos are from the New York assembly debating the 2013 SAFE act (SO2230). The honorable Steven F. McLaughlin takes issue with many parts of the act, and his debate is well worth a watch (first video). In the second video, Assemblyman Lentol asks that Assemblyman McLaughlin not share a list of items that Democrats lobbied for inclusion into the SAFE act since they would “dampen the enthusiasm for compromise”. Here’s a link to Assemblyman McLaughlin’s page where he details what that list entailed. This list (hosted on scribed) has been altered to reflect the final provisions in the bill. Number one on that list includes the confiscation of assault weapons. There is also an item regarding the confiscation of ten round clips. Neither of these points became law, but the fact remains that these confiscation proposals were being considered by the legislative bodies of New York State. 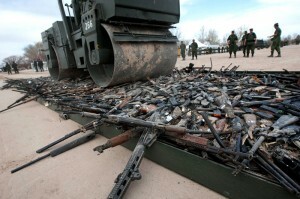 Maryland, 2013: How to Collect Assault Weapons? Here is the link to the original article. This one is tough to verify because it talks about an email and I couldn’t find any corroborating evidence of it aside from a pile of pro-gun sites and blogs talking about the same press release. 3) Surrender the assault weapon or large capacity magazine to the appropriate law enforcement agency for destruction, subject to specific agency regulations. If the proposal becomes law, those who violate it will be charged with a Class C felony, punishable by up to seven years in prison. As of this writing, the chances of this becoming law are reportedly slim, but it is being considered. The guns were returned and the State police quickly made a statement that no one is taking guns because of anti-anxiety meds, and that it was all a mistake and not their fault. Someone, though, decided that it was OK to search medical records and use that information to issue a confiscation order, and the NY State Police obeyed the order to do so. This law is a little different in that it’s not aiming to remove certain guns from everyone, but rather to remove all guns from certain people – people that the state considers prohibited persons. To be fair, this law does not appear to target the law-abiding gun owner, but I included it because the news articles supporting this law made a point of mentioning confiscation. California bill SB-140 allocates $24 million for the confiscation of firearms from people that may have been legal owners before, but who the state now considers unfit. Criminal convictions or serious mental illness qualifies someone as being unfit. I don’t know of anyone who thinks that someone with a serious mental illness should own guns, but California has a history of changing its mind about things (read the Roberto Roos section, above), and terms can change legal meaning over time. 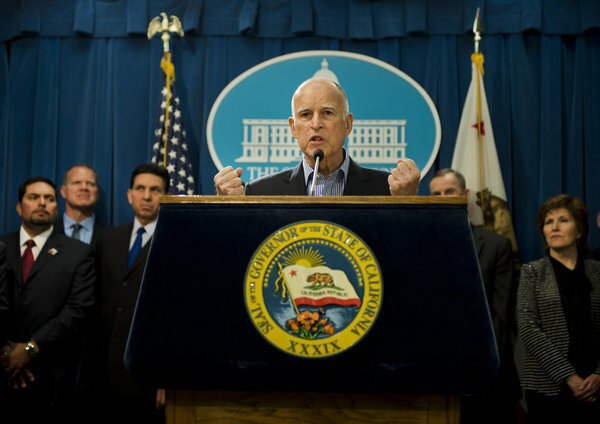 The California DOJ Armed Prohibited Persons System (APPS), which this bill will help enforce, cross-references people who have legally purchased handguns and registered assault weapons against individuals who are prohibited from owning or possessing them. Many people feel that this is a good thing because they’re only taking guns away from people who shouldn’t have guns, and technically, the officers ask for the guns as opposed to taking them. I included this one because even the Huffington Post calls it a confiscation bill, which it is, but only for prohibited persons. From what I’ve read, there are many legislators that would like many, if not all, of our guns to be turned in or confiscated and then destroyed. There have also been documented cases of firearms confiscations and mandatory “turn-ins” in America, though none of them have resulted in a scene like the one pictured. To the credit of our system of government, many bills proposing confiscation did not pass because they were voted down. 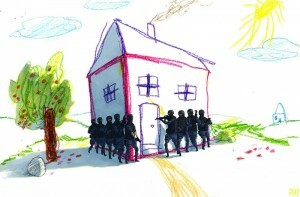 Perhaps, then, the idea of confiscation is being proposed by some vocal few, and the majority doesn’t agree with them. In most cases, that seems to be the case, but by the same token, I can see why gun owners are constantly on the outlook for politicians that seek to ban and confiscate guns, especially as the dates of these events seem to indicate, after major disasters or tragedies. As for the nature and impact that these events, bills and laws, and how they reflect on the political landscape of today and beyond, I’ll leave that for you to decide. I simply wanted to present the list of confiscation-related items as I found them, mostly because I did, in fact, find them.